This anonymous fragment of around 1500 is painted on cloth. Such works were cheaper and lighter than panel paintings, and had the advantage that they could be rolled for transport or storage. They were sometimes used to cover organ shutters or altarpieces during the 40 days of Lent before Easter. 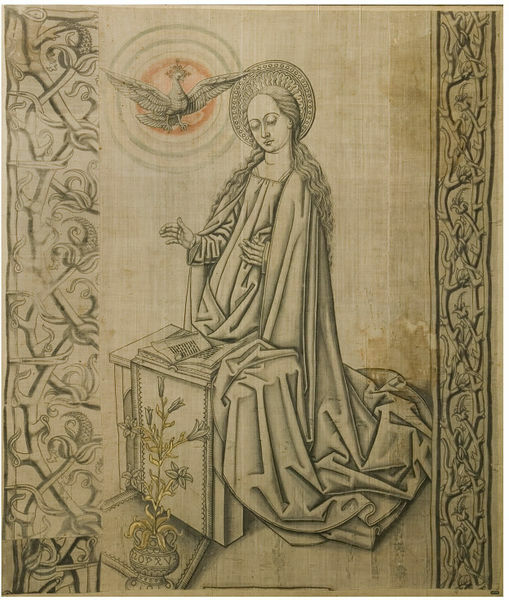 The Virgin kneels before an open book with her attribute of a Lilly in the foreground while the Holy Spirit appears above her head in the form of a dove. The fragmentary border to the left has been moved to this location to mask the gap left by the missing figure of the Archangel Gabriel which originally faced the Virgin. The original dimensions of this work may have exceeded 300 x 400cm. This fragment was apparently found in a Spanish convent, and the style of the Virgin's halo suggests that it was made in Valencia. Stylistically, it is based upon Netherlandish paintings of the mid-fifteenth century, which were exported in considerable numbers to Spain and Portugal. Flemish paintings were also copied by German engravers, whose prints disseminated their imagery throughout Western Europe. As a result, most Spanish painters of the later fifteenth century worked in styles which were essentially of Flemish derivation. This is a significant example of the once common but now rare Late Medieval genre of painting in grisaille on cloth. Image of the Virgin Mary, painted on linen. Bought from C. Gurtubay, London, in 1928. According to a V&A memorandum, dated 28 June 1928 (R/F MA11/G2135) the vendor stated that P.19-1928 ‘has been sent over to him from Spain and it is stated to have been found in a Spanish convent’. Historical significance: P.19-1928 appears to have been assembled from elements of an originally larger whole. The image of the Virgin Annunciate has been visibly cropped at its bottom and left edges, and would originally have been accompanied by a representation of the Angel Gabriel, probably to the left of the Virgin, on a lost continuation of the support, or possibly on a separate piece of cloth. The vertical decorative borders of woven branches at right and left are apparently surviving elements of a border which ran around the periphery of the whole. The fragmentary border attached to the left edge has lost over a third of its width, and would originally have been about 60cm wide. It repeats the design of the narrower border at the right. The seam which runs through the trailing edge of the Virgin’s mantle may not be original, and the strip of cloth which currently comprises the right edge of P.19-1928 may have been transferred to this location, and the edge of the mantle added to conceal the join. The narrow border may originally have run along the top edge, and the broad one along the bottom or one of the sides. If the original composition was on a continuous support, its overall dimensions would probably have exceeded 300 x 400cm; larger than most painted altarpieces, and of comparable size to a substantial tapestry. Although P.19-1928 is essentially a grisaille painting, the nimbus around the Holy Ghost and the stem of the lily were originally coloured – presumably to emphasise these significant accessories. The inscription around the edge of the vase has not been deciphered. The iconography and formal repertory of P.19-1928 derive ultimately from Flemish religious paintings of the early to mid-fifteenth century. These were exported to various regions of Western Europe, and especially to Spain and Portugal, where they had a major impact on local productions. By the middle of the century, such works were being copied by German engravers, which disseminated their imagery more pervasively and further afield. 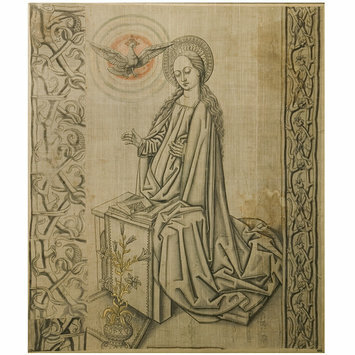 The facial type and attitude of the Virgin, the flat, geometrical folds of her mantle and the cruciform nimbus of the Holy Ghost, in the form of a dove, are reminiscent of the engravings of the anonymous Master E.S., active in the Rhine region from the mid-1450s until 1467. He was one of the most productive and influential print-makers of the fifteenth century, and his works were exported to many regions of Europe, including Italy. The tracery borders of woven branches are also German in character; reminiscent, for example, of that which appears at the top of the woodcut of God the Father on fol. 1v of the Nuremberg World Chronicle, published in 1493 in large Latin and German editions, and also exported widely. According to a V&A memorandum, dated 28 June 1926 (R/F MA11/G2135) M.J. Friedländer had seen nothing similar to P.19-1928, and its proposed dating of around 1500 was a consensus of the opinions of Martin Hardie, E.W. Tristram and Bernard Rackham. Although initially catalogued as ‘probably Flemish perhaps Antwerp school’, its identification as Spanish has not been doubted since it was first proposed in 1936. On the basis of the Virgin’s double halo (inner circle with flames and outer circle with pearl-like decoration) – which resembles several in Valencian paintings of the late fifteenth and early sixteenth centuries – it has been suggested that the work was produced in Valencia. This is not implausible, as Valencia was one of the largest and most cosmopolitan cities in Aragon, and a major centre of cultural exchange between the Iberian Peninsula and Northern Europe. A principal early enthusiast for Netherlandish painting was Alfonso V the Magnanimous (1416-1458), King of Aragon and Naples, whose collection included religious paintings on linen by Rogier van der Weyden. (Wolfthal, op. cit., p.15). He also owned panel paintings by Van Eyck, to whom he sent the Valencian painter Lluis Dalmau to study in 1431. Painted after his return from Flanders, Dalmau’s Madonna of the Counsellors, in Barcelona, indicates his familiarity with Van Eyck’s Ghent Altarpiece. Dalmau also painted a cloth altar frontal with a scene of The Annunciation -now lost- for the castle of Xátiva in the province of Valencia. Such paintings, as well as German prints, may have provided a precedent for P.19-1928. This work is of considerable significance, as an indicator of how prototypes of Netherlandish origin were disseminated throughout Western Europe, and a major example of the once-numerous but now exceedingly rare genre of grisaille on cloth. During the Middle Ages and the Renaissance, many pictures were painted in water-based colours or distemper on linen or canvas. For example, in fifteenth century Bruges as many as 40% of painters seem to have specialised in such work. (Wolfthal, op. cit., pp.6-7). In Flanders during the fifteenth and early sixteenth centuries, the exterior shutters of painted triptychs were usually decorated with monochrome paintings in grisaille (black and grey), and often with representations of The Annunciation. To reduce the weight attendant on their large size, movable organ shutters were sometimes made of stretched canvas rather than planks, and decorated with religious images. Monochrome paintings on cloth could serve as cartoons for tapestries, or as wall hangings in heir own right. ‘Lenten cloths’, painted with religious subjects in sober colours, were sometimes hung before altars during Lent, the forty days’ period of fast preceding Easter, when it was a liturgical requirement that altars should be covered. A Virgin and Child of around 1400, in grisaille on cloth, survives in the Cathedral of Huesca, and another, from Palencia and of late fifteenth century date depicting The Annunciation and The Visitation, is in the Prado. The Annunciation was an especially appropriate subject for Lenten use, as its feast day occurs on March 25th. On account of the fragility and low intrinsic value of these images, only a tiny fraction of this production has survived. Because of their low rate of survival, and consequent lack of comparative works, it can be difficult to divine the original purpose of such pictures. The subject-matter and large scale of this image suggest that it was made for display in a religious setting of some size, which is consistent with its apparent discovery in a Spanish convent. Elisa Bermejo, ‘La Anunciación y la Visitación del Maestro de la Leyenda de Santa Lucía’, in Boletín del Museo del Prado, 1995, pp.11-14. 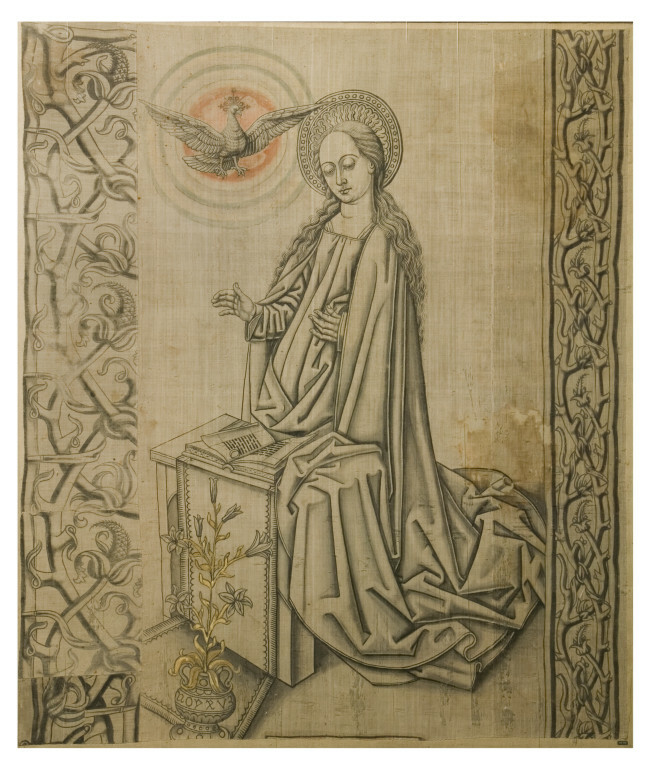 Anonymous Valencian School, distemper on linen, depicting The Virgin Annunciate. Spanish, ca. 1500. Kauffmann, C.M. Catalogue of Foreign Paintings, I. Before 1800. London: Victoria and Albert Museum, 1973, pp. 283-284, cat. no. 348. Attribution note: The technique of painting in pigments bound with animal glue and water on a cloth support is generally known as distemper painting (Tüchlein in German or Aguazo in Spanish). It is mentioned in treatises on painting from the Middle Ages until Francisco Pacheco’s Arte de la Pintura of 1638. Its principal advantage in comparison with oil or tempera on panel was its relative speed and cheapness. It was also especially suitable for works of large format, for occasional use, or export – as such pictures were light and could be rolled up. Its disadvantage is its fragility; the vast majority of works in this technique have been lost, and the few that survive are generally in poor condition.